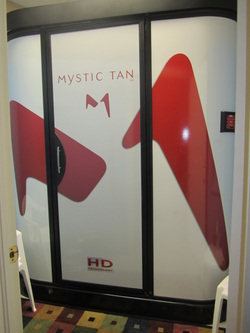 With Mystic HD you can experience a revolutionary heated sunless treatment that delivers natural-looking results while keeping you warm and dry from start to finish. From the moment you enter the warm, inviting environment, your skin is infused with heat, which allows for maximum absorption, creating a deeper,longer, lasting high-definition color. A sweeping side-to-side airbrush travels gently from head to toe, applying precise amounts of your desired level of color, while a flow of warm air ensures that skin remains dry and you remain comfortable.